St. Mary’s University students benefit from a diverse group of national speakers and guest lecturers as well as myriad opportunities to serve the community. This section provides an overview of speaker and lecture series; for more details, please see the university event calendar. Each year the University invites men and women who have shaped the Catholic Intellectual Tradition to come to St. Mary’s, and to share their knowledge and participate in conversations, not only within the University, but with the wider community in San Antonio and beyond. The Catholic Intellectual Tradition is at the heart of the educational enterprises at St. Mary’s University, because it is an intellectual tradition with a heart. It is what we do within the University community, within the ecclesial community, and within the civic community. The love of learning that drives this tradition is moved by the desire to understand and live our Catholic faith, and also by a hunger for all knowledge of truth and practiced goodness. Glenn MacTaggart (J.D. ’79, M.A. ’89), longtime attorney and counsel with Prichard Hawkins Young LLP, and his wife, Karla MacTaggart, gave a major gift to St. Mary’s to create the MacTaggart Catholic Intellectual Tradition Lecture Series Endowment. The gift allows for the recruitment of speakers from various faith traditions to speak to the University and San Antonio communities about such topics as Catholicism in a changing world, religion in a pluralistic society, and faith in areas such as art and science. View more information and a listing of 2019-2020 speakers. The Community Conversations series, a public issues forum series, is a part of the Institute for Public Administration, Politics and Public Policy. One of the primary goals of the Institute is to develop outreach programs that foster dialogue between the University, the public, government agencies and nonprofits to address important public issues. Topics have included city-wide preschool offerings, public transportation, water resources, how the U.S. Mexico border fence impacts environmental justice, and personal conversations with community leaders. For more information on Community Conversations, visit the event calendar for upcoming dates. 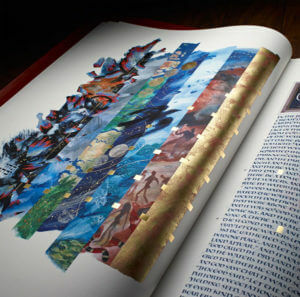 The Saint John’s Bible is the first handwritten, hand-illuminated Bible to be commissioned by a Benedictine Abbey in more than 550 years, and its seven-volume Heritage Edition now resides at St. Mary’s University. The Saint John’s Bible was commissioned in 1998 by the Benedictine monks of Saint John’s Abbey and University in Collegeville, Minn. The Heritage Edition, valued at about $150,000, is a full-scale reproduction of the original masterpiece; each volume measures 2 feet tall by 3 feet wide when open. Only 299 sets exist, and St. Mary’s was the first in Texas to own one. Learn more about The Saint John’s Bible at St. Mary’s. Rubén M. Escobedo (B.B.A. ’60) and his wife, Verόnica Salazar Escobedo, gave a major gift to create the Escobedo Saint John’s Bible Lecture Series Endowment. The gift allows for the recruitment of scriptural scholars, research and curriculum design, and other programming as St. Mary’s seeks to establish a Center for Catholic Studies. The Forum on Entrepreneurship Breakfast Series is a partnership between St. Mary’s University and the San Antonio business community. The purpose of the Entrepreneurship Breakfast Series is to advance entrepreneurial activities in San Antonio and promote the development of student scholarships at St. Mary’s. The series was started in 1986 by Brother Paul Goelz, S.M., Ph.D. It is conducted by the Meadows Center for Entrepreneurship Studies within the Greehey School of Business at St. Mary’s University. 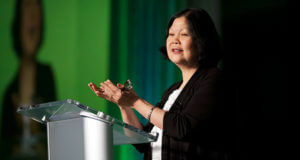 Speakers include a variety of business newsmakers from both the local area and state. Visit the Greehey School of Business events page for more information on The Forum on Entrepreneurship Breakfast Series and related events. The Jose Miguel Cimadevilla Memorial Seminar Series is a campus-wide seminar series held on Friday afternoons in honor of the late Jose Miguel Cimadevilla, Ph.D. It serves as a diverse platform for students and faculty to present and discuss recent advances in their research endeavors, and also invites guest speakers to campus in which they can share with students their expertise and stories from their careers and lives. Speakers are local professionals, professors from neighboring universities, and St. Mary’s students who have completed a notable project, internship or study abroad experience. As part of the Maximizing Access to Research Careers (MARC) Undergraduate Student Training in Academic Research (U*STAR) program, Cimadevilla initiated a biomedical research seminar series that met on Friday afternoons. These seminars consisted of local as well as national speakers. The Cimadevilla Memorial seminar series is a natural extension of a program initiated by Cimadevilla more than 20 years ago. Visit the School of Science, Engineering and Technology events page for more information about The Cimadevilla Memorial Seminar Series and related events. 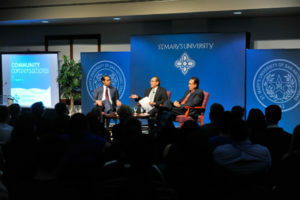 The Lin Great Speakers Series is presented to the public as a community service. The lectures are made possible by an endowment established in memory of Shu-Chi Lin by his widow, Mrs. Chang Le-Chiao Lin, and their son, Vincent Lin, Ph.D., a St. Mary’s alumnus and former faculty member. Lectures feature Nobel laureates and other distinguished speakers who represent music and the arts, science, engineering, technology and medicine, humanities and global interests, and economics, business and law. 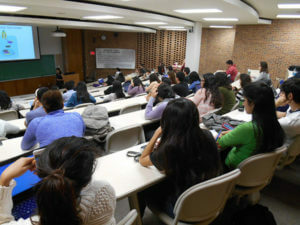 Topics of lectures have included health care, interfaith dialogue and the challenges of globalization. Each year, the Lin Great Speakers Series lecture is preceded by the Conference on Justice and Social Concerns, a two-day event during which the campus community explores important social and justice issues affecting society. To view more upcoming events at St. Mary’s, click the button below to access the full calendar.